In our last post, Emily Hewson drew on Maslow, whilst Naomi Stanton wondered about Labour. Joel Lazarus’ latest blog on his site, Agent of History, looks to Gramsci and in particular Paolo Freire for inspiration in grappling with the dilemmas of our age. Joel’s emphasis on critical dialogue ought to strike a chord with all youth and community workers. And what is the nature of this dialogue that we must all enter into with each other in order to ‘name the world’? 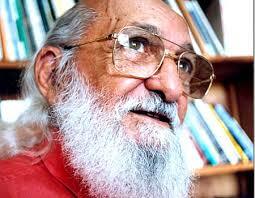 For Freire it had four components. It had to start with love: ‘Dialogue cannot exist…in the absence of a profound love for the world and for people. The naming of the world, which is an act of creation and re-creation, is not possible if it is not infused with love.‘ Second, it had to be founded on faith: ‘Dialogue further requires an intense faith in humankind, faith in their power to make and remake, to create and re-create, faith in their vocation to be more fully human (which is not the privilege of an elite, but the birthright of all). Faith in people is an a priori requirement for dialogue; the “dialogical man” believes in others even before he meets them face to face‘. Third, dialogue cannot exist without hope, and, fourth, ‘true dialogue cannot exist unless the dialoguers engage in critical thinking‘. He ends his piece with this plea. If you are reading this gripped by despair, frightened by the prospect of so much more human suffering, then please think about the ideas presented here. I really believe, now more than ever, that there is no innocent bystander; that we all now have a clear moral obligation to act. Spending a bit more on your bananas or coffee won’t do it; giving money to charities won’t do it; even volunteering in shelters or food banks won’t do it. All these are admirable actions, but are reformist rather than revolutionary. We need to come together to act and build our future. It’s already begun. However, before we act we need to create spaces and time for genuine dialogue. We need to talk…and we need to listen. So, please, have faith in each other. It will be richly rewarded and our democracy can be built upon nothing else. Next Today, May 17, is the International Day Against Homophobia, Transphobia and Biphobia.